Vee Pee Inc. is the leading Supplier of SIP(Session Internet Protocol) based products like Conferencing system, IP Voice Telephony, IP Multimedia and Video Telephony, IP Gateways, IP Analog Telephone Adapters(ATA's), IP-PBX Solutions and IP Video Surveillance Solutions in the global market. The awarded recognition world wide in Industries. we produce Innovative SIP-based products for small-to-medium business and for consumer markets clients. Our all the products are broadly acceptable and interoperable with the major third parties available SIP products as per the SIP industry standards into the market. Open SIP-based standard products can reduce the communications cost and enhance the productivity of the organizations and enterprises. IP Phone: SIP Phones Solutions for Small, Enterprise and Residential clients. Video Phone : IP Multimedia Video Phone Solutions. DECT Phone : IP DECT Cordless Phones Solutions. IP- PBX : IP-PBX Appliance Solutions. ATA's : IP Analog Telephone Adapters and IAD Solutions. VoIP Gateways : IP Analog Gateways Solutions. IP Camera : IP Video Surveillance Solutions: Cameras, Encoders, Decoders. Conferencing System : Audio Conferencing and Video Conferencing System. Get your all the VoIP products solutions now from our expert team which can provide solutions and give full support on IP Voice, Video and Surveillance solutions contact us. 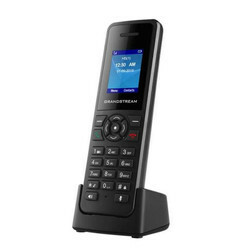 Grandstream GXV3240 is an affordable executive video phone that runs Android 4.2. This powerful and stylish phone includes a built-in 1 MP video camera, allowing you to video conference from your desk. The GXV3240 has a 4.3" capacitive touchscreen LCD, a simple-to-use interface, particularly as you use Android to access the Google Play Store and run apps from your deskphone. Integrated WiFi and Bluetooth support, as well as the built-in speakerphone, give you options for hands-free communication. GXP1610 Product Brochure/Specifications availalble here"
The Grandstream GXP1620 phone features an HD handset and wideband audio support. Also use the full duplex speakerphone for handsfree telephony, or connect a headset and compatible EHS cable to the phone. Audio is improved through echo cancellation, QoS support and a wide range of supported voice codecs. A total of 13 dedicated function keys enable users to quickly access important features like mute, conferencing, messages and recording to the phone system. 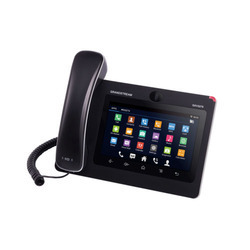 Set up the Grandstream GXP1620 phone with SIP-based IP PBX appliances. The phone’s display has an XML browser for accessing applications and overall improving your productivity. GXP1620/1625 Product Brochure/Specifications availalble here"
Power your conferences with Grandstream GXV3370! A video phone with SIP integration, GXV3370 features a beautiful 7" touchscreen display, integrated 720p HD camera, and built-in Bluetooth and dual-band WiFi. 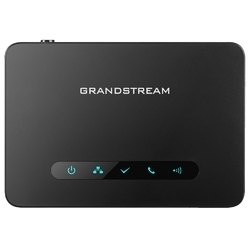 Grandstream GXV3370 runs Android 7.0, making it easy to pick up and giving you access to the apps in the Google Play Store. The Yealink SIP-T21P E2 is a step up from the previous edition. The phone offers a backlit LCD display and dual-color LED keys, which the Yealink SIP-T21P does not. The backlit display presents information more effectively and with better clarity. Dual-color LED keys can be used for availability features such as busy lamp fields and immediate line status indication. Yealink HD Voice technology lends the SIP-T21P E2 phone amazing call quality and voice recognition. Adaptive jitter buffer, echo cancellation and full duplex technology further enhance the phone’s audio capabilities. Communicate through the phone’s handset, speakerphone or headset port. The phone supports additional features such as IPv6, OpenVPN and other ultramodern solutions. Power the phone via PoE or the optional AC adapter. 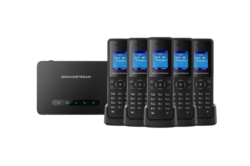 Grandstream DP750 is a SIP-compliant base station that lets you pair up to 5 Grandstream DP720 DECT handsets, supporting 10 SIP line registrations and 4 concurrent calls. Any handset connected to the DP750 can be mapped to any SIP account and vice versa, and the base station lets you choose the mode of ringing of the paired handsets: circular, linear, parallel or shared. The handsets have a wireless range of 50 meters indoors or 300 meters outdoors. Increase productivity in the office, warehouse, or retail store by empowering your employees to collaborate without being tied to the desk. The DP720 handsets give you HD wideband audio and 3-way conferencing. The Grandstream DP750 base station is PoE compliant with Layer 2 and 3 Quality of Service control. Dimensions: 1.12" x 5.12" x 3.54"
Integrated Bluetooth allows users to sync their mobile phone calendar and contact books with the GXV3275, use Bluetooth headsets, and transfer calls to and from the phone to Android mobile phones. By combining a state-of-the-art IP phone, an advanced video conferencing solution, and the Android operating system, businesses of all types can now use oneGrandstream Video Phone for all their communication and productivity needs. Runs the Android™ Operating System 4.2 and offers full access to the Google Play - Store - which includes thousands of business productivity apps such as Skype, Microsoft Lync, Salesforce1, GoToMeeting.
" GXV3275 Product Brochure/Specifications availalble here"
GXP1450 is a next generation enterprise grade IP phone that features 2 lines with 2 SIP accounts, a 180×60 backlight graphical LCD, 3 XML programmable context-sensitive soft keys, dual network ports with integrated PoE, and 3-way conference. The GXP1450 delivers superior HD audio quality, rich and leading edge telephony features, personalized information and customizable application service, automated provisioning for easy deployment, advanced security protection for privacy, and broad interoperability with most 3rd party SIP devices and leading SIP/NBN/IMS platforms. 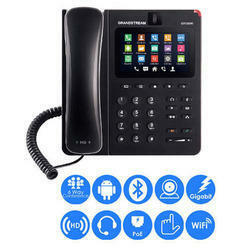 It is a perfect choice for enterprise users looking for a high quality, feature rich IP phone with affordable cost. 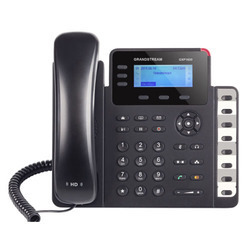 The GXP2160 is a state-of-the-art enterprise level 6-line SIP phone that features a 4.3 inch color LCD, 5 programmable context-sensitive soft keys, 24 programmable BLF extension keys, dual Gigabit network ports, integrated PoE and Bluetooth, 5-way voice-conferencing, and Electronic Hook Switch (EHS). The GXP2160 delivers superior HD audio quality on the handset and speaker phone, rich and cutting edge telephony features, and personalized information and customizable application service. The GXP2160 also supports automated provisioning for easy deployment, advanced security protection for privacy, and broad interoperability with most 3rd party SIP devices and leading SIP/NGN/IMS platforms. 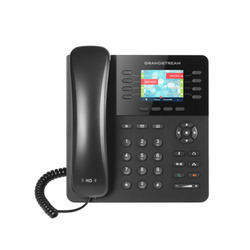 Ideal for enterprise and SMBs, the GXP2160 is a powerful color-screen IP Phone for users who handle high call volume and require access to advanced voice communication. 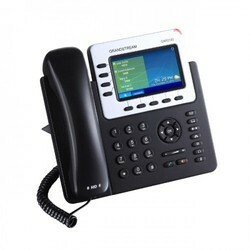 Reckoned as leaders in this industry, we are providing our esteemed clients with excellent quality Grandstrema GXP2170 IP Phone. 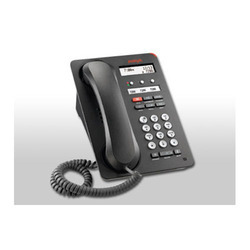 The offered phone is an enterprise IP Phone for users needing to handle daily high call volumes. The GXP2170 features up to 12 line keys and 6 SIP accounts on a full color 4.3 inch display. It also has a full duplex-speakerphone with HD audio capabilities for quality and clarity over voice calls. The offered range is manufactured using high grade components and contemporary technology by our vendors' skilled experts. We assure our clients that our range is quality tested on predefined parameters, in order to meet industry standards. Apart from this our prestigious clients can avail this phone, as per their needs, at highly competitive price. 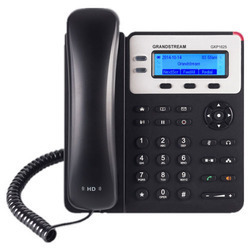 "GXP2170 Product Brochure/Specifications available here"
Grandstream DP720 is a powerful cordless handset that uses the DECT protocol to enable mobile VoIP communication at a range of up to 300 meters outdoors or 50 meters indoors. Each handset can handle up to 10 lines. Perfect for warehouses, retail stores, offices and other spaces where talking while not at your desk is prized, the DP720 gives you HD wideband audio, 3-way local conferencing, and a full-duplex speakerphone. The display is a bright 1.8" LCD with two soft keys for contextual selections. Grandstream DP720 comes with two rechargeable AAA batteries that give you up to 20 hours of talk time or 250 hours of standby time before needing to be recharged. The DP720 comes with a charger cradle, and with a micro-USB port for an alternative charging method or non-battery use. A 3.5 mm headset jack lets you use your favored headset with the Grandstream DECT handset. 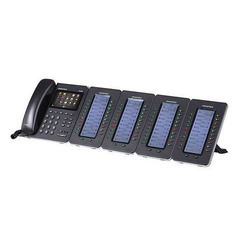 Pair up to 5 DP720 handsets using the Grandstream DP750 base station, avialable separately. 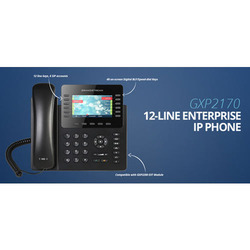 Dimensions of Handset: 6.10" x 1.97" x 1.02"
GXP2200EXT delivers additional functionality, versatility and flexibility to Grandstream GXP2200 enterprise IP Phone. The GXP2200EXT module features a large 128 x 384 graphic LCD and 20 programmable buttons (each with dual color LED). In addition, it allows up to 40 extensions per module by using the 2 page switch keys and up to 160 buttons when 4 extension modules are daisy-chained together. The GXP2200EXT module is connected, powered, and controlled by the GXP2200, providing the benefits of the additional keys instantly. This expansion module supports the traditional call features on each of its programmable buttons, including BLA (bridged line appearance)/SCA (shared call appearance), BLF (busy lamp field, standard or event list), Call Park/Pick-up, Speed Dial, Presence, Intercom, and conference/ transfer/forward. The GXP2200EXT is the ideal solution for offices that manage high call volumes or an office receptionist. By using the _GXP2200EXT the telephone attendant can ensure maximum office productivity by efficiently monitoring and dispatching multiple incoming calls. 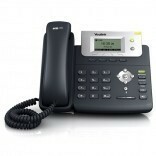 We produces an incredible variety of VoIP phones. Shop entry-level phones with one or two lines, to high-end models with an unbelievable amount of features. Whichever you choose, the phones are intuitive to operate and easy to provision with your existing IP PBX. IP phones and video phones with Android operating systems set the bar for functionality. Download your favorite apps and use them just like a smartphone or tablet. Certain phone models even work with IP surveillance technologies so you can see visitors at your front door. 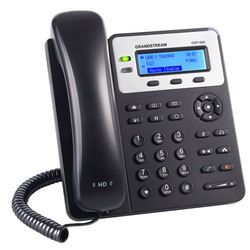 The Grandstream GXV3240 is a multimedia Gigabit VoIP Video phone with perfect for 3-way video conferencing with a tiltable CMOS camera and HD audio/voice. The GXV3240 has integrated wi-fi, a built-in web browser, and HDMI connectivity, making this video phone the perfect solution for high-tech campuses and companies. 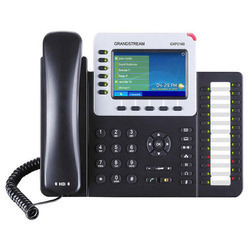 This Grandstream Video Phone is compatible with the Grandstream GXP2200EXT module for an expandable front desk solution for a large company directory. Integrated Bluetooth allows users to sync their mobile phone calendar and contact books with the GXV3240, use Bluetooth headsets, and transfer calls to and from the phone to Android mobile phones. By combining a state-of-the-art IP phone, an advanced video conferencing solution, and the Android operating system, businesses of all types can now use one IP Phone for all their communication and productivity needs. Runs the Android Operating System 4.2 and offers full access to the Google Play Store - which includes thousands of business productivity apps such as Skype, Microsoft Lync, Salesforce1 & Go To Meeting. Offers a multi-platform video conferencing solution (Grandstream’s Free IP Video Talk, Skype, Microsoft Lync, and more). 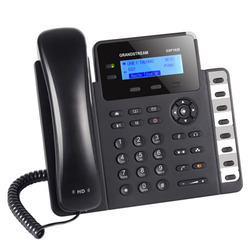 "GXV3240 Product Brochure/Specifications available here"
To meet diverse requirements of our prestigious clients, we are engaged in providing an excellent range of Grandstream GXV3275 Video IP Phone. It is a 6-line multimedia video phone with a 7" color touch screen. Only high quality components are used while manufacturing the offered range, for increased compliance with international standards of quality by our reliable vendors. The offered phone is highly appreciated among clients for their high performance and compact design. Apart from this, our range is offered in different specifications and can be customized, as per precise needs of our clients and at highly competitive prices. 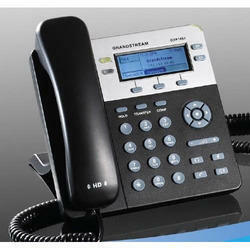 Grandstream produces an incredible variety of VoIP phones. Shop entry-level phones with one or two lines, to high-end models with an unbelievable amount of features. Whichever you choose, the phones are intuitive to operate and easy to provision with your existing IP PBX. 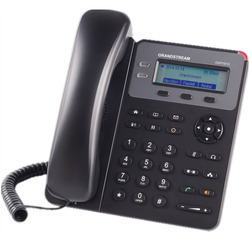 Grandstream IP phones and video phones with Android operating systems set the bar for functionality. Download your favorite apps and use them just like a smartphone or tablet. Certain phone models even work with IP surveillance technologies so you can see visitors at your front door. Yealink phones are representative of what state-of-the-art technology can do to dramatically improve any SIP-based VoIP environment. The desk phones and wireless solutions from Yealink are highly affordable and reliable, delivering enterprise-class features without the high-end price you’d expect. 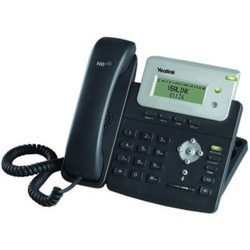 VoIP desk phones and video phones from Yealink include the SIP-T2, SIP-T3 and SIP-T4 series. The SIP-T2 series is designed for cubicles and desks, the SIP-T3 series for executives and managers, and the SIP-T4 for power users and an overall excellent experience. 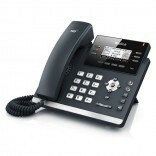 The Yealink SIP-T4 series offers features such as touchscreens and ergonomic designs. Avaya phones are designed with intercompany communications and customer interactions in mind. Modern workforces are highly mobile and require quick, effective exchanges. The desk phones, wireless phones and conference phones from Avaya are game changing solutions for today’s businesses. Avaya builds an array of analog phones, digital and VoIP phones. Find phones for SIP, Avaya IP Office and unified communications. Available accessories let you fully customize and optimize your phone’s productivity. 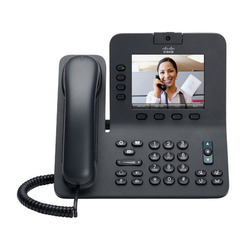 Cisco phones include the new 8800 series, as well as the widely popular SPA series. Features such as built-in webcams and adjustable displays leverage the higher-end models as perfect video collaboration endpoints. The phones are also easy to provision, ideal for larger enterprise-scale deployments. Cisco is a name is we all recognize. More than likely, you’ve worked somewhere with a Cisco phone on the desk or a Cisco networking appliance running the behind-the-scenes action. These VoIP phones represent the best of what a globally recognized company can do to improve your business’ critical telephony infrastructure. Cisco VoIP phones enable individuals, virtual workgroups and teams to collaborate with ease, facilitating better team interactions. Information can be shared easily with Cisco IP solutions. Cisco phone system platforms are a popular choice for many users, including: Cisco Call Manager, Call Manager Express, UC500, and UC300 series phone systems. Using the SIP protocol, Cisco phones are also an excellent choice for Asterisk, Trixbox, Switchvox and other open source phone system platforms. Cisco Phones Cisco phones include the new 8800 series, as well as the widely popular SPA series. Features such as built-in webcams and adjustable displays leverage the higher-end models as perfect video collaboration endpoints. The phones are also easy to provision, ideal for larger enterprise-scale deployments. Cisco is a name is we all recognize. More than likely, youve worked somewhere with a Cisco phone on the desk or a Cisco networking appliance running the behind-the-scenes action. These VoIP phones represent the best of what a globally recognized company can do to improve your business critical telephony infrastructure. About Cisco Phones Cisco VoIP phones enable individuals, virtual workgroups and teams to collaborate with ease, facilitating better team interactions. Information can be shared easily with Cisco IP solutions. Cisco phone system platforms are a popular choice for many users, including Cisco Call Manager, Call Manager Express, UC500, and UC300 series phone systems. Using the SIP protocol, Cisco phones are also an excellent choice for Asterisk, Trixbox, Switchvox and other open source phone system platforms.